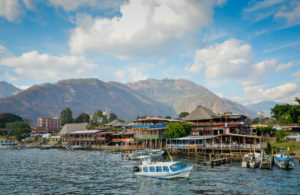 If there’s only one town you can visit in Guatemala’s Lake Atitlan region, seasoned travelers usually recommend to go to the town of Panajachel. Fondly called by locals and returning visitors as Pana, this Guatemalan town is relatively well-developed for tourism compared to other neighboring towns. Panajachel is located in the Western Highlands of Guatemala, sitting comfortably on the North shore of the beautiful Lake Atitlan. But it is not the kind of the place that will “wow” you in terms of magnificent sites. Instead, Pana is all about experiences, including immersing yourself to the local prevailing cultures. And there are many cultures flourishing in Panajachel. Aside from the Ladino Guatemalans, you can find Maya descendants including Kaqchiquel and Tzíutujil living peacefully around town. These people are very gifted in the field of arts and handcrafting. If you are looking for authentic handicrafts, then just visit some of the the Maya villages and you will not be disappointed. Panajachel is the undisputed commercial center and transport hub in the region. It makes a perfect base for your exploration as many tour agencies have established themselves here. While here, you can easily book various tours and day trips around Lake Atitlan and nearby attractions like the Atitlan Nature Reserve and butterfly sanctuary. One spot where you will feel the lively atmosphere that Pana has been known for it’s Calle Santander. This street is very famous for shopping, and is hailed one of the best in the country. Santander is also home to a slew of restaurants, travel agencies, shops and internet cafes. Casa Cakchiquel is one of the town’s most notable landmarks just on the corner of Santander. Built in 1948, it is one of the first hotels to be established in the region of Lake Atitlan. 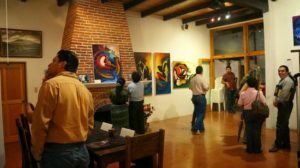 It is believed that prominent artists, writers and political figures including Ernersto “Che” Guevara, stayed in Casa Cakchiquel. These days, the restored house is home to exhibits, a photo and postcard gallery, and a fair trade store. If you want a respite from the consistently busy vibe of the Calle, then make your way to the lakeshore, which is the more tranquil area. 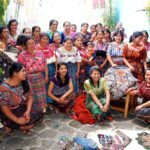 Some travelers who tend to stay around Atitlan area for a long period of time usually volunteer to help local and indigenous groups through initiatives like teaching and feeding programs. Since life is not too hectic in Panajachel, it makes a perfect place to spend some time learning Spanish. If you like the outdoors, activities like kayaking, paragliding, boat tours and cycling are offered to enhance your enjoyment of Pana. 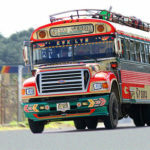 To reach Panajachel, you can take the local bus (called chicken bus) service from Guatemala City. This service leaves about every hour from 6:00 AM to 4:00 PM. Chicken buses are cheap, but take note that there are poorly maintained recycled U.S. school buses. The long ride to Pana on them can be quite uncomfortable for some. However, riding a chicken bus is as Guatemalan as you can get. Another option is to book a proper tourist bus or shuttle to Panajachel. Once you get to town, you can pretty much walk everywhere because Pana is small and compact. 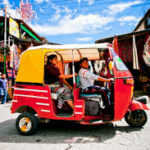 However, there is also a good presence of affordable public transport like the three-wheeled tuktuk, chicken buses and shuttle boats for exploration. For a map of Guatemala, go Here.